Arizona is known for having spectacular sunsets, perhaps it's just because there are so many sunny days here, or perhaps it's due to the desert dust in the air or something else. 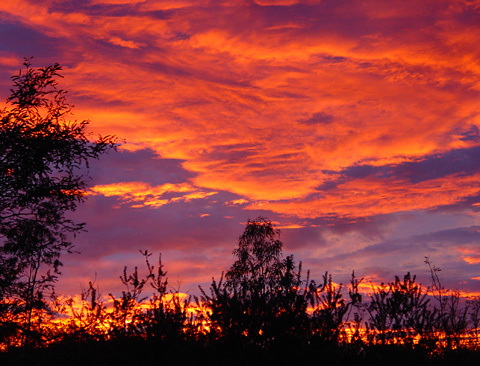 Here in Tucson, some of the best sunsets occur in the summer monsoon season (July and August) when there are late afternoon scattered clouds (the remains of old thunderstorms) which can take on brilliant hues in the setting sun. Sunsets so brilliant that they dazzle the eye can also occur here at other times of the year, such as this surprisingly vivid November sunset.